Hashem Khastar, an Iranian teachers union leader based in Mashhad, makes a victory gesture in this undated photo. His wife told VOA that security personnel detained him near Mashhad on Oct. 23, 2018, and sent him to a hospital for a purported mental illness. The wife of a prominent Iranian teachers union leader said Wednesday that Iranian security forces had detained her husband and hospitalized him for a purported mental illness that she knew nothing about. Hashem Khastar, a unionist representing teachers in Iran's northeastern Razavi Khorasan province, was the latest of several education activists to be detained in Iran this year while promoting teachers' rights to engage in union activities and protest peacefully for better working conditions. In phone conversations with VOA's Persian and Kurdish services, Sadigheh Maleki said her 65-year-old husband, a retired teacher, had gone missing a day earlier while tending to a family farm in Golbahar, near their home in Mashhad. She said she had found Khastar's empty car adjacent to a park while searching for him. After trying without success to reach Khastar by phone and contacting local authorities to check on his whereabouts, Maleki said she received a phone call Wednesday from a person using a blocked number who identified as a member of the Islamic Revolutionary Guard Corps. She said the IRGC member told her that security personnel had taken her husband to Mashhad's Eben'e Sina Hospital for treatment of a mental illness. Maleki told VOA that Khastar had been mentally and physically fine before his detention. She said she had gone to the hospital to check on him but was told by a nurse that security personnel were preventing people from approaching his hospital room. 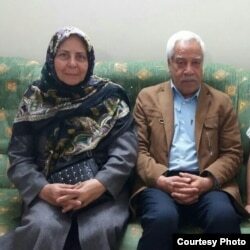 Sadigheh Maleki and her husband, Iranian teachers union leader Hashem Khastar. Maleki said she left the hospital after several hours and was concerned that Khastar might have suffered some kind of trauma that would have necessitated mental health care. There was no immediate comment about Khastar's case in Iranian state media. Khastar has been detained several times for his education activism, most recently having served a prison term from 2009 to 2011. He also has publicly criticized Iran's Supreme Leader Ayatollah Ali Khamenei in online forums, including calling him a "dictator" in a January 2018 commentary published by Iran Kargar, an overseas-based Iranian pro-union group. Earlier, the New York-based Center for Human Rights in Iran reported the arrests of five Iranian Teachers' Trade Association members by Iranian authorities in connection with a nationwide teachers strike held Oct. 13. The strike, called by Iran's Coordinating Council of Teachers’ Syndicates, involved teachers staging sit-ins at schools around the country to demand reforms of the national education system. Iran's Human Rights Activist News Agency said last month that Iranian authorities had tightened their grip on labor unions in recent years and had shown a "particular vitriol" toward those representing educators. Three other prominent education activists serving multiyear terms at Tehran's Evin prison include Mohammad Habibi, Mahmoud Beheshti Langroodi and Esmail Abdi. This article originated in VOA's Persian service. Shahed Alavi of VOA’s Kurdish service contributed.